Betterment is known as a top tier robo-advisor that invests your money automatically using computer algorithms. The company has many strings to its bow, including tax-optimized portfolios, goal-oriented investing, and socially responsible portfolios. And now another “string” has been added: charitable giving. Betterment has launched its philanthropic service that allows customers to donate shares directly from investment accounts to charities in an easy and tax-efficient way. All you need to do is specify how much you wish to donate and to which charity. Plus, Betterment does the heavy lifting for you by showing you how much in estimated tax savings you receive from each donation. Which Charities Can You Support At Betterment? 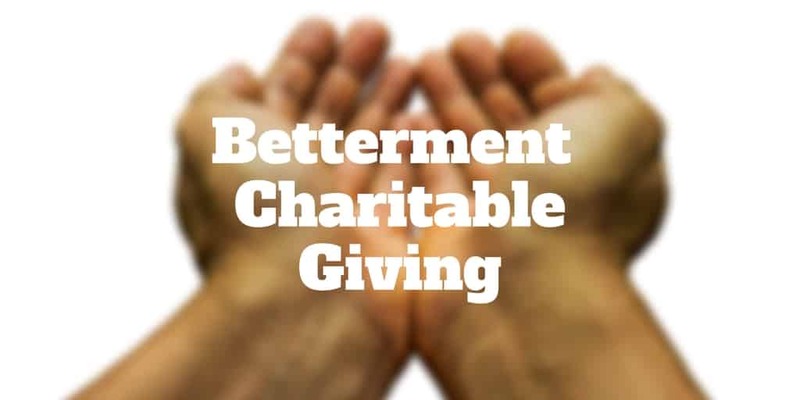 How Does Betterment Charitable Giving Work? What Do You Need To Know Before Giving? Traditionally, when donating online, you need to transfer cash or write a check from your bank account to the charity. If you hold shares in a brokerage account, the problem is you need to encash them and potentially suffer the capital gains tax hit. However, when you donate via Betterment, you can give shares directly without first having to convert them to cash. So in addition to enjoying a tax break from donating, you also avoid the capital gains taxes on shares that are donated. Another big advantage of donating through the Betterment platform is that the value of money you intend to give is maximized. Instead of merchant processing fees from credit card transactions offsetting some of the donation or paying fees to other intermediaries, the full donation amount is received and enjoyed by the charity. Plus, you receive the donation receipt from Betterment to use during your tax filing process to make tax season easier. When you decide to donate shares, Betterment shows you how much of your money is eligible for donation and potential tax savings. Whichever shares fall into the highest tax category will be automatically selected. Each share you donate is 100% kept by the charity because no processing fees are charged. And because you are donating shares with long-term capital gains, you save more on taxes than if you made a cash, check, or credit card donation. All donations are made securely and Betterment provides donation receipts to simplify your tax filing process. Another benefit of charitable giving is that you can boost the tax benefit from tax-loss harvesting because donating shares gives away future embedded gains taxes. >> Related: What Is A Betterment Tax-Coordinated Portfolio? Before donating shares to charities via Betterment, you should know some of the “small print” when giving. First, you are only permitted to donate shares with long-term gains so all positions must be held for at least one year. The reason is that investors don’t receive the same benefits from donating shares with short-term capital gains taxes. Next, you should be aware that not all charities will be featured on the platform initially but Betterment does offer a “Request” form so if you want one added, you can simply hit the button to ask for your preferred charity to be added. For investors who would like to amortize their donations by contributing on a monthly basis, Betterment does not provide an auto-giving feature to make regular contributions. Betterment charitable giving program is a unique way to maximize your philanthropic donations by gifting shares directly to charities without paying fees to third party intermediaries, such as credit card companies and merchant processors. Unlike most traditional charitable giving programs that help donors to save money on taxes, Betterment helps customers to enjoy even greater tax breaks by avoiding capital gains on shares donated. If you ever wished 100% of your donated money would go to charity, Betterment now makes it possible to avoid processing and brokerage fees. While Betterment doesn’t have an extensive network of charities on its platform yet, it will increase as time goes by and users can request their preferred charities. Even now, some of the largest charities in the U.S. are featured, including UNICEF USA, World Wildlife Fund, and Breast Cancer Research Foundation. The bottom line is if giving is important to you, Betterment makes it simple to maximize your donation to selected charities and maximize your tax breaks. >> Betterment or Wealthfront: Which Is Better? >> Betterment Review: Is It The Best Robo Advisor? >> Are Betterment Returns Higher After Taxes? ‹ Options vs Stocks: Which Should You Choose?